We were standing in our room exhausted from this weekends event when Tom looked down and saw it. 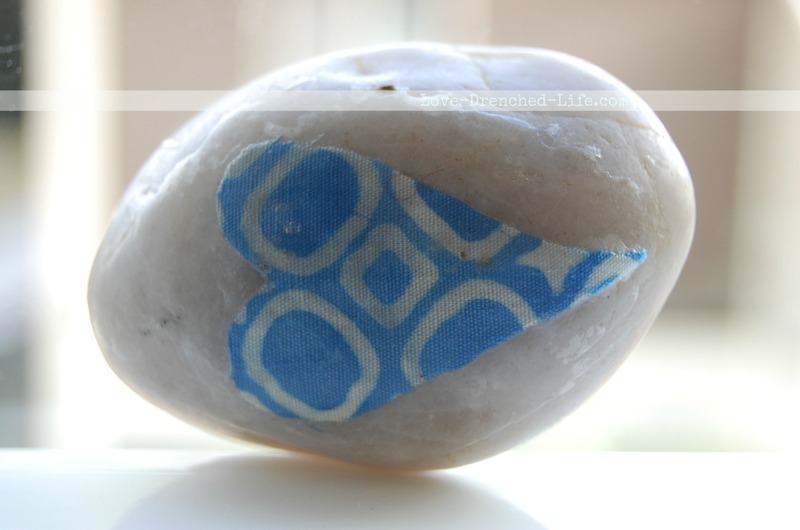 A shiny rock with a blue and white heart signifying it was more than just a rock but a Love Rock. It must have fallen from a top of the door frame where other Love Rocks, which were made for our wedding, have found their home. I think in the three years we’ve been married I may have picked up two that fell from this ledge. Tom picked it up and looked on the back, in this case it was more than just a regular Love Rock; beautifully written on the rock were these words, All my Love and Hope to You Love Abigail. After a long couple of weeks preparing, and a long weekend of celebrating our girls gifts, this was exactly what we needed; A sign from our Abigail that all is well in Heaven. We have found we can do so much here to celebrate, honor and bring love and joy, but nothing that we do will ever bring our girls back. I’m sure this sounds obvious to most but for Tom and I we sometimes (well, all the time) we just wish that we would unlock the door, walk inside our house and have them jump on us, arms wrapping tight around our necks with kisses all around. My heart hurts knowing that this will never again be a reality here on earth. We are proud of our girls in ways we never thought we would be. Giving life to others goes beyond what we ever thought we would be celebrating. Their example of love and joy that has been spread across the nation through Love Rocks is something I could never have imagined was possible. Our life here is to celebrate our girls and to honor their love and joy in every way we can. We do so by listening to God and following the tugs in our heart that are clearly directing us. We will never come home to hugs and kisses, and our hearts will always have an ache, but we are proud and will continue to listen and smile when the girls give us a Heavenly nudge and in this case, a Heavenly Hug. We have found a lot of Love Rocks these past few weeks but this one is by far our favorite. You and Tom continue to celebrate your precious girls in such amazing ways. I know that your hearts ache constantly, however I am so happy that you are able to find some joy. And what a beautiful Love Rock from Abigail! Love this! You will feel those embraces again one day! I so wish you could hold them everyday. But I know they will both continue to leave you signs that they feel your love in heaven and want you to feel their love back! Love your girls! I love that Abby left this beautiful sign for you both. Thank you again for allowing us to be there celebrating the wonderful gifts Abigail gave. We are super proud of the both of you. I’m sure you girls are even prouder to have such wonderful big hearted parents. We love you! I couldn’t put words to it before, but it was “following tugs at my heart that were directing me ” that led to your quilt ! I love how LOVE ROCKS are this contagious way to spread joy and love to all! Love you, friend! And Yes, phone date soon !! You name it, and I’ll be ready! Amazing how the girls know just what you need….and when you need it. So much love they have for you both. Saturday was such a great afternoon of education and love. Thank you for sharing your girls lives with us. What remarkable young ladies you raised.